After many years of house-envy -- and my family of four living in a tiny apartment -- we moved into my absolute dream house, a three-story c. 1897 brownstone in Park Slope, Brooklyn. This was many years ago, when these houses weren't particularly desirable (hence, still somewhat affordable), and I give thanks every single day (this is not an exaggeration) that I get to live here. 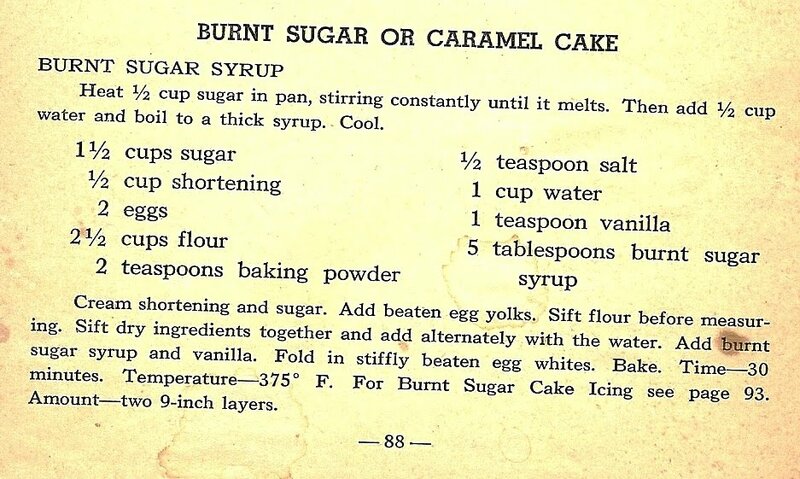 My "new old" recipe appears in a c. 1938 book that belonged to Mrs. Lloyd Johnson, the grandmother of my work colleague Renee. Nearly every cake recipe in this book is extremely appealing; I scanned pages of them and plan to bake them all pretty soon. That said, this Brownstone Cake was sadly disappointing. In fact, it was beyond disappointing. Just look at the picture at top, for starters. I was going to name this Slip Sliding Away. I obviously did *something* wrong with the frosting. The cake itself, which I made first, was also a problem. 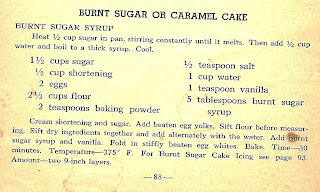 The caramel syrup (which is supposed to give the cake a rich dark color, hence the brownstone reference) didn't work. 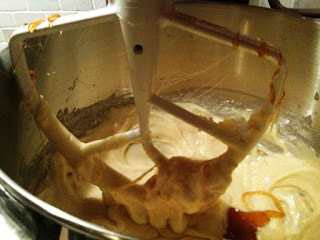 It hardened too much so that, instead of the liquid form it was supposed to have, it hardened into caramel candy threads (see picture above). I broke it into pieces and added it to the batter, hoping some magic would happen in the oven causing it to "melt in" to the mixture. 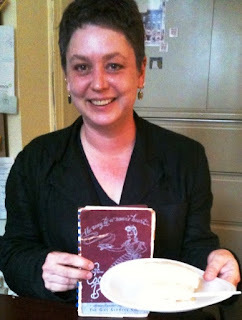 That it did -- the finished cake did not contain any stray bits of candy. 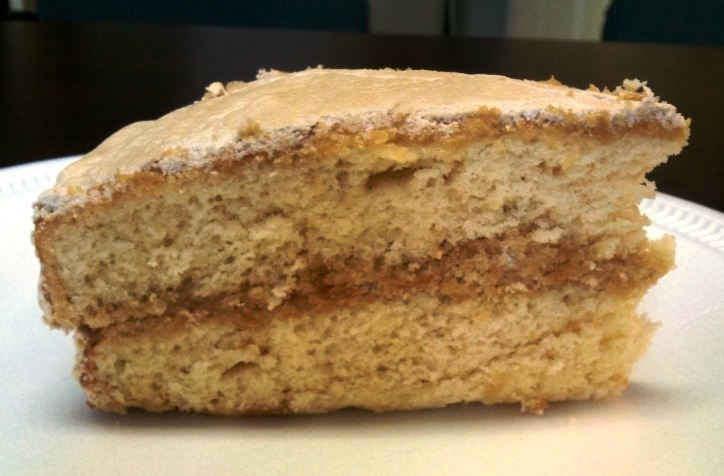 I cut the cake into slices before bringing it to work and each slice looked amazingly normal, considering the aesthetic of the intact cake. When Renee stopped in my office and I told her my disappointment with the finished product, she said that her grandmother, a very sweet and upbeat lady, would have found something very nice to say about the cake, no matter what. Well, the "brutally honest" gene must have slipped into the family two generations later, because as Renee took a bite, she said quite frankly, "It's dry." She was right, and I truly appreciated her honesty. 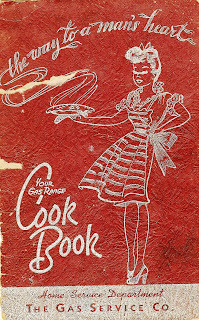 Luckily, I have many more of Rose Johnson's recipes left to try. I'm sure one of them will be perfect. 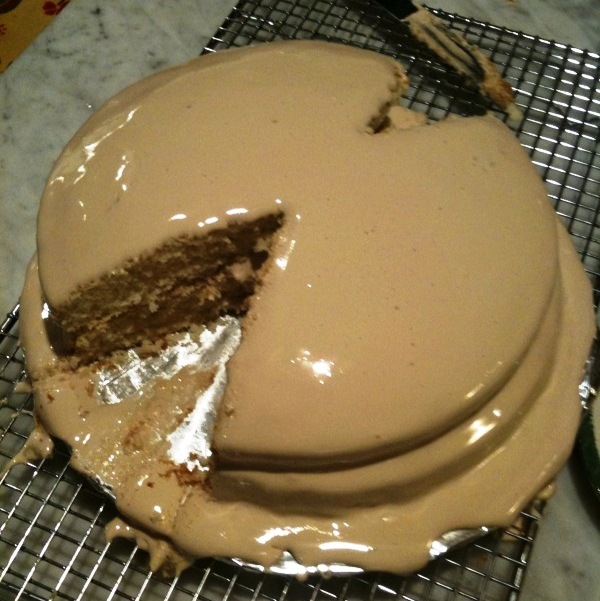 I agree, frosting looks like industrial colored paint or brown elmers glue. It's a nice break to not have a craving after reading one of your posts! i'm with margaret! 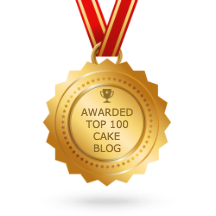 first time i'm reading your blog without feeling like i need a sugar fix. and thank you for being so honest about your own work. it's what keeps me coming back to your blog for seconds and thirds! Thank you for makimg me smile with every blog! Is This Cake in Season?